As well as the second half of our touch season 2017 also brings the opportunity to represent PPT. 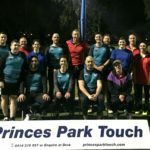 https://princesparktouch.com/represent/ And in particular the yourPodiatrist Cup on the 21st January 2017 in Portland, and the Affiliates Cup on Sunday 26th February 2017 (Social divisions) at Betula Reserve, Doveton. we are looking not just for players but for people to captain teams so please let us know if you are keen and spread the word! All regular players at PPT mut be members and this is the information they need to know.